ATEN is set to present its latest innovations at ISE 2017, including its virtual KVM-over-IP matrix system (KE6900, KE6940), in a hands-on live demonstration at booth 8-N210. ATEN will show how virtual KVM matrices are installed in control rooms, to create workspace flexibility with instant access to various servers and video sources. The ultimate benefit is its video wall function and shared access modes, combined with advanced security options. This makes the KE-series well suited for security, broadcasting, and traffic control rooms. Moreover, in supermarkets, the system can connect point-of-sales consoles with computers to centralize the IT infrastructure in a server room. With additional support for touchscreens, full HD, and virtual media, ATEN provides versatility to serve several markets. Another newcomer is the VK-series hardware control system, an all-round control and automation system that fits new and existing installations, such as conference rooms, media distribution, or control rooms. It allows users to control multiple devices with a single button, physical or digital. ATEN also developed configuration software (VK6000) to set up the installation, along with a physical controller (VK2100), which supports infrared, serial, network, I/O or relay connections. “To keep installation simple, ATEN chooses not to oblige installers to use complex code languages,” said Marc Salimans, sales director at ATEN Infotech. “Everyone can design a customized GUI with our drag-and-drop system.” However, customizing macros and serial commands is still possible. At the ATEN booth in Hall 8, the VK-series control system will control almost the entire booth, including a control room, miniature office, and an entire media distribution setup. 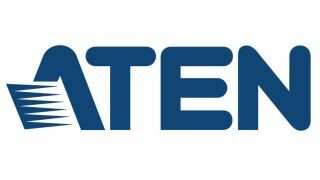 In addition, ATEN has expanded its Ultra HD media distribution range, with new extenders, splitters, and matrix switches, for high bandwidth without signal delay, regardless which software or operating system is used. ATEN HDBaseT technology covers distances up to 70m when transmitting uncompressed Ultra HD content, Ethernet, power, USB, and control commands through a single Cat-x cable. • 11:00 a.m.: Managing your control room and IT infrastructure. Learn how to upgrade to a secure and remote over IP management system in full HD and how to manage workstations, monitoring and video walls in a multi-user setting. • 3:00 p.m.: Which AV hardware solutions to use in business, retailer educational setups? Finding the right hardware for future-proof installations. How to set up one touch to control an entire setting.